I am sure happy I learned how to make baked cheesecake recipes. Although I love all cheesecakes, I really prefer the baked ones when I am hungry for cheesecake. Most of the no bake ones seem more like a “refrigerator dessert” to me. I love the texture of the baked recipes. I have learned to make baked cheesecake recipes by the hundreds. Here I have gathered together some of my favorites that are a little different in some way. You might say these were “life changing” to me as a dessert lover. For instance when I first learned how to cook sweet potatoes, it was mainly baking plain ones like my mom did; add a little butter and eat like any baked potato. Then at Thanksgiving I learned how to cook sweet potatoes and dress them up a little; cut the baked ones up, add butter and brown sugar. The really special ones were topped with marshmallows. Still at that time I did not know how to make baked cheesecake recipes. They simply were not in my vocabulary yet so I never thought about putting sweet potatoes in one. My most wonderful experience in learning how to cook sweet potatoes is when I tried them in a pie. If you haven’t tasted a sweet potato pie, I highly recommend it. The taste is delicious! 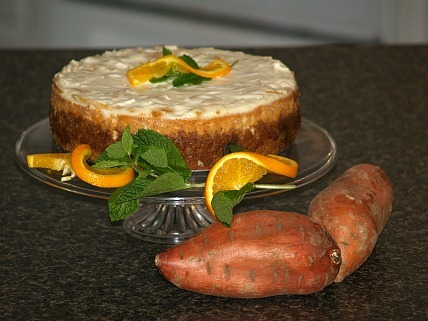 When I finally started making baked cheesecake recipes, the sweet potato cheesecake was an instant temptation. This one is great anytime of the year but especially nice for Thanksgiving; with the touch or spice and orange it is perfect. Next you will find one of the baked cheesecake recipes made with cornmeal. I only remember using cornmeal for two recipes when I was young; corn bread and Dad always made mush when we butchered a hog. After I got older and traveled more I really enjoyed desserts made with corn meal. This was a great discovery! I found cornmeal cake in Costa Rico was very delicious. The same goes for my discovery of the Italian cheesecake made with cornmeal. The Creamy Vanilla Cheesecake is not unusual but it also was a great discovery. All the cream cheese produces a delicious textured cheesecake. The recipe is so versatile in producing other flavors of cheesecakes. I have found it so handy to have in my collection of recipes. Last you will find one of the baked cheesecake recipes made with white chocolate. When I was young I loved milk chocolate but I did not know what white chocolate was. I was excited over discovering white chocolate and a creamy white chocolate cheesecake was a “great find”. NOTE: Do not confuse white chocolate with the white confection. Combine cracker crumbs, pecans, 3 tablespoons sugar, pumpkin pie spice and melted butter. Press in bottom and 1 inch up sides of 10 inch spring form pan. Bake crust 6 minutes; set out to cool. Beat cottage cheese on medium speed until smooth. Add to cottage cheese the cream cheese, 3/4 cup sugar, grated rind, pumpkin spice and salt; blend in. Add eggs one at a time beating well after each addition; fold in sweet potatoes. Combine sour cream and marmalade; stir to blend and pour over top of cheesecake. Bake 10 minutes longer at 300F degrees; set on rack to cool. Run knife around rim to loosen cake from sides; DO NOT REMOVE SIDES UNTIL COMPLETELY COOLED. Chill for at least 8 hours before serving. Preheat oven to 350F degrees; grease and flour 9 inch spring form cake pan. Bring water to a boil; gradually pour in the cornmeal. Cook over medium heat stirring constantly for 30 minutes or until cornmeal mixture comes away from the sides of pan; set off of heat. In a large mixing bowl beat the ricotta until smooth; blend in sugar, cinnamon and salt. Gradually blend in the cooked cornmeal. Work in the raisins; place batter in prepared pan and smooth top. Scatter pine nuts over the top; dot surface with lard. Bake for 45 minutes or until top turns golden brown. Let cool to warm and turn cake out onto platter; cool completely before serving. I found this recipe years ago in Southern Living Magazine. It is so versatile and can be easily changed into many different kinds of delicious baked cheesecake recipes. I also want to add that “vanilla extracts” are all not the same. I recently tried a brand called “Danncy”. It is the best flavored that I have ever used and it makes a world of difference in the taste of vanilla cheesecakes and anything you make with vanilla. Try different brands until you find one that you really like. Beat cream cheese until light and fluffy; gradual add sugar blending well. Add eggs one at a time beating well after each addition; stir in vanilla. Bake for 40 minutes; turn oven OFF. Partially open oven door and let cheesecake set in oven for 30 minutes. Remove cake from oven and let cool away from draft to room temperature. Run knife around sides to release cake from sides of pan. Cover cheesecake and chill for at least 8 hours. Remove sides of pan and garnish with strawberry fans to serve. Variation for Crème de Menthe Baked Cheesecake Recipe: Use chocolate wafer crust (Recipe Below). Stir ¼ cup green crème de menthe into cheesecake mixture when the vanilla is added. Bake for 45 minutes at 350F degrees. Garnish with chocolate curls. Variation for Praline Cheesecake: Use graham cracker crust (Recipe Below). Substitute dark brown sugar for white sugar in cheesecake mixture. Sauté 1 cup chopped pecans in 3 tablespoons melted butter; drain on paper towels. Fold nuts into cheesecake mixture when vanilla is added. Bake for 45 minutes at 350F degrees. Garnish with toasted pecan halves. 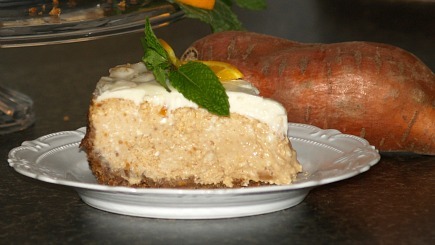 Variation for Brown Sugar and Spice Cheesecake: Use gingersnap crust (Recipe Below). For cheesecake substitute brown sugar for the white sugar. Add 1 teaspoon ground cinnamon, ½ teaspoon ground cloves and ½ teaspoon nutmeg when sugar is added. Bake at 350F degrees for 45 minutes. Garnish with whipped cream and sprinkle with nutmeg. The flavor of baked cheesecake recipes can be altered simply by changing the crust recipe; below are some examples. Combine crumbs and melted butter; blend well. Press into bottom and 1 inch up sides of 10 inch spring form pan; bake at 350F degrees for 5 minutes. Substitute 1 2/3 cups chocolate wafer crumbs for graham cracker crumbs. Substitute 1 2/3 cups gingersnap cookie crumbs for the graham cracker crumbs. Melt white chocolate morsels of low heat; stir until smooth and cool. Beat cream cheese, sugar and vanilla on medium speed until smooth. Beat in eggs; gradually beat in melted white chocolate. Bake in preheated oven at 350F degrees for 40 to 50 minutes or until set. Cool on wire rack; chill for several hours until firm before removing sides of pan.